Vince Moefa’auo and Maddison Garrett and coffee aficionado Stuart Mulhern are best known for the popular The Ground Coffee and Food at the Brisbane Broncos’ training facility in Red Hill. 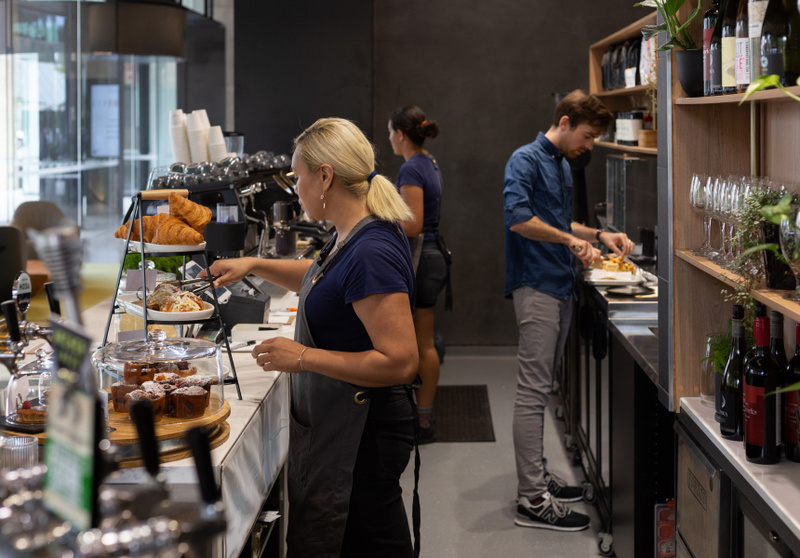 After opening that cafe in early 2018 the trio quickly realised the space was too small for the amount of fresh food they wanted to prepare, so the search began for a second space that could serve as a production kitchen. 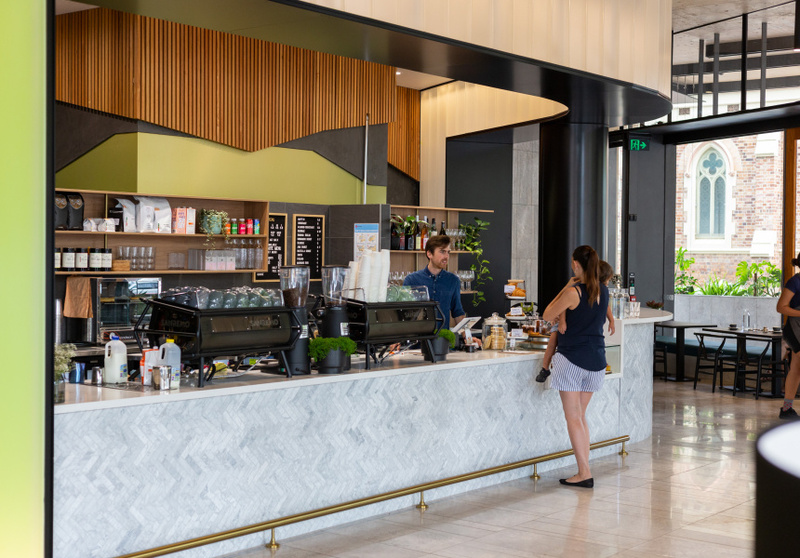 But once they entered the handsome foyer of the newly renovated ground floor space at 100 Brookes Street, the concept went from additional kitchen space to additional cafe. 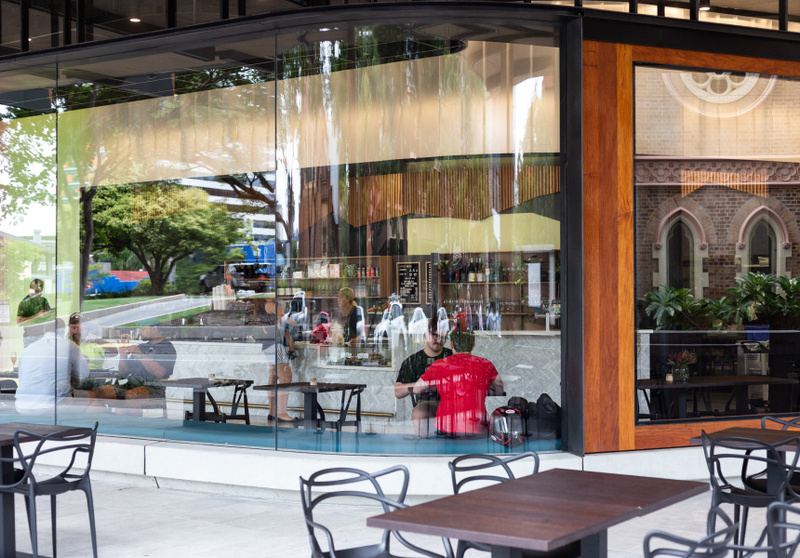 Tonic Design created Halo Ground Coffee and Food’s pared back interior, which combines timber panelling with marble and gold finishes. Dark wooden tables and deep teal-coloured lounge seating trace the curve of the building. 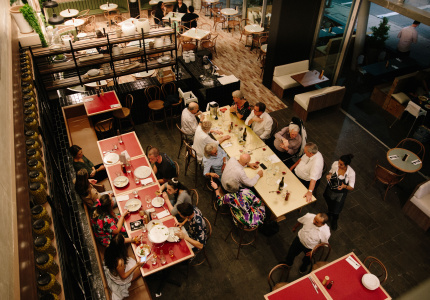 The venue seats 60 and offers views of the two neighbouring churches that inspired the cafe’s name. Head chef Casey Poland (formerly of Sasquatch and Sake) has created an extensive breakfast and lunch menu with a mix of plant-based and omnivore dishes. Tofu prepared two ways and served with sticky shiitake broth tsuyu is a nod to Poland and Moefa’auo’s experience with Asian cooking — so too a sweet potato waffle with Japanese fried chicken, wombok slaw, poached egg and house-fermented kimchi. Mulhern, who is vegan, says they wanted to create a menu that respected people’s food choices. 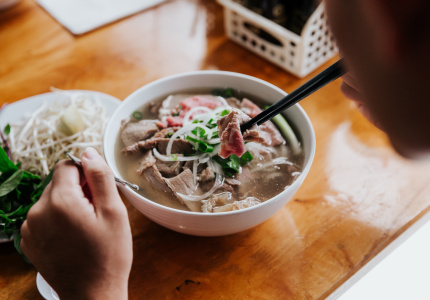 As well as plant-based menu items, there are options for vegetarians, pescatarians and people who are gluten or dairy free. Halo Ground Coffee and Food also has its own dedicated pastry chef who prepares croissants, cinnamon scrolls and the like for both cafes. Coffee comes from Brisbane roastery Cleanskin Coffee Co, where Mulhern used to work. 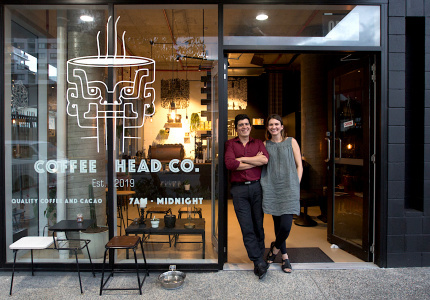 He says a lot of cafes specialise in either good food or coffee, but Halo Ground aims to do both. The cafe runs late on Fridays, giving nearby office workers a space to wind down at the end of the week. 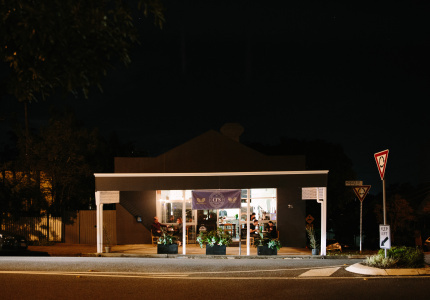 James Squire’s apple cider and a New Zealand Panhead XPA are both on tap, and the venue has an entirely vegan wine list featuring shiraz, sauvignon blanc, rosé and pinot noir from Australia and New Zealand.